It was a great pleasure for me to see Nancy Haynes and Mike Metz, an artist couple with a long tenure of making art in New York, exhibited side by side in Surviving Sandy. Nancy Haynes, L to R: “retinal boundary,” 2012. Oil on linen, 18 x 21 1/2. “retreat,” 2012-13. Oil on linen, 18 x 21 1/2. “rue jacob,” 2011. Oil on linen, 18 x 21 1/2. “referent for departure,” 2012. Oil on linen, 18 x 21 1/2″. “stopping place,” 2012. Oil on linen, 18 x 21 1/2. Courtesy of the artist. Photo by Brian Buckley. 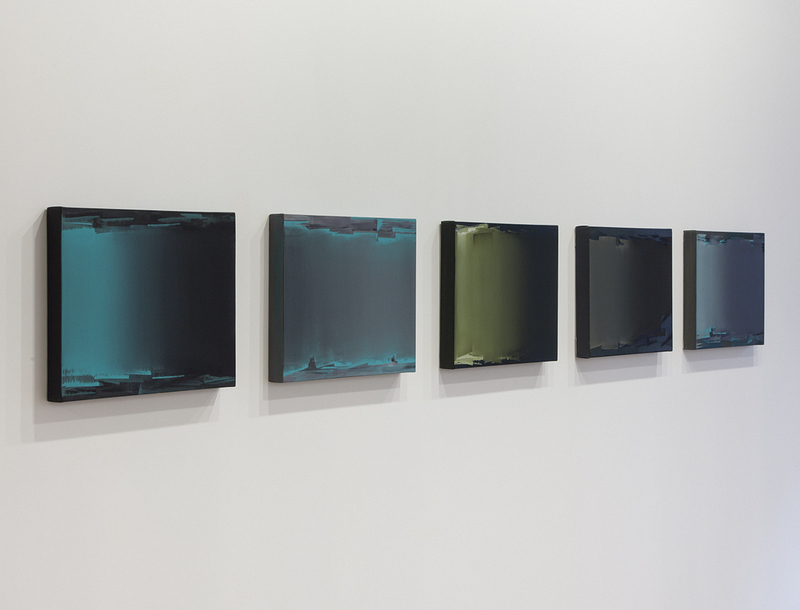 In each of Haynes’s five paintings shown here, subtle shades of a single color (along with pure blacks and whites) are applied so exactingly it becomes an empirical search towards representation—and yet the underlying philosophical inquiry makes it anything but. It takes a very sensitive intellect to render an unnatural light with such subtlety. In rue Jacob, a canvas roughly the size and shape of a television or computer screen, Haynes’s light evokes the ambient glow of an ignored TV set, especially the anonymous light from homes on an isolated suburban street at night. In capturing light and alienating color, paint sustains the versatility to overwhelm the sense of sight. Though all of the paintings in these series play off an ostensibly impersonal structure, the titles, usually added at the end, belie the artist’s personal consciousness. Rue Jacob for example, is named after the home address of a dear friend, suggesting that the artist finds something personal in the painting, perhaps encouraging us to do the same. This all proves Haynes’s singularity, as she is interested in more than the painting as an object, and more than paint’s relationship to reality—which is why she is so persuasive in finding the middle ground between the plane of the surface and the illusionistic possibilities of her own consciousness in paint. Mike Metz, L to R: “snared-trapped elephant-opera glasses,” “snared-trapped pipe-axe,” “snared-trapped binoculars-toothache,” “snared-trapped vest-rabbit,” “snared-trapped high chair-Pegasus,” All 2011. All steel cable, wooden strut, building foam, 24 x 24 x 24″. Courtesy of the artist. Photo by Rachel Styer. Though working in a completely different realm, her husband, Mike Metz, explores similar boundaries between object and illusion through sculpture. Seen next to Haynes’s paintings, the use of a single color—specifically, gray—is emphasized. 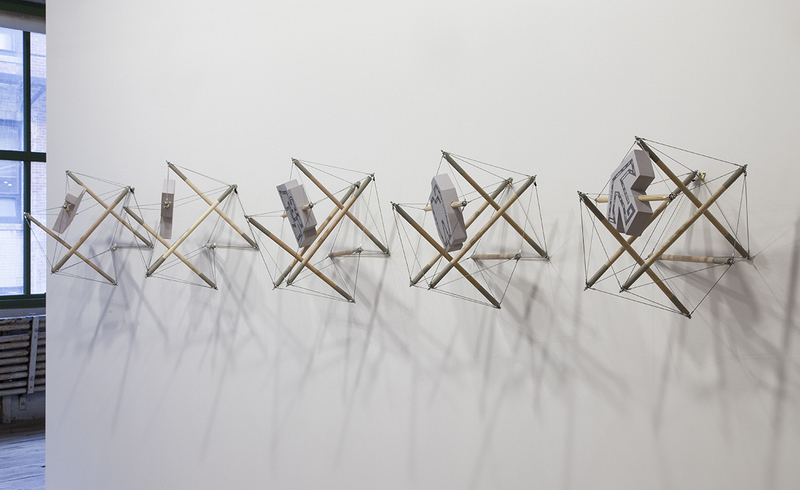 In five works from his trenchant snared, trapped, and concealed series (totaling 30), he works with an octahedral tensegrity structure, an exceptionally strong engineering method explored by Buckminster Fuller in which three or more rods are connected by tensioned threads, but do not touch. Inside each structure a gray foam sculpture floats, roughly the shape of two objects glued in assemblage, such as a bouquet of flowers and fighter jet. By conflating these two things with each title, in this case “snared-trapped bouquet-fighter jet,” each piece pushes meaning towards and away from the shape of that object. It is a portmanteau in sculpture—“bouquet” does not sound like “fighter jet,” but they are similar in shape and thus fused into one representational object. Meanwhile, a thick black line outlines an ambiguous shape within the gray foam, carrying white text, “snared by the bouquet on the tip of my tongue, yet trapped by the fighter jet in the back of my mind.” To bring language into the equation is to further question how the identity of a thing is tied to it’s shape, and whether a name or shape can better signify meaning. Metz’s gesture is refined but intricate, exactly as these seemingly delicate structures disguise a powerful feat of engineering—revealing how the efficacy of a name is quite fragile. Next to Haynes’s paintings, one realizes how the color gray is used to control one variable in Metz’s experimental word/object equations. “Gray … isn’t luminous—gray can only be lit” as Wittgenstein noted in Remarks on Color. Gray is brought to life by Metz’s thoughtful, complicated questions about how form and language signify meaning. Likewise, Metz’s profound look into the shape and name of an object reveals a subtle personal aspect to Haynes’s paintings that lies beneath a rigorous exertion of color.